Now that fall has arrived and the school year is back in full swing, there are many STEM activities in the months ahead. Here are a few upcoming activities I want to spotlight this month. Dr. Bassam Shakhashiri will be giving a lecture in Cahners Theatre (2nd floor, Blue Wing) at 1:00pm and 3:00pm. Dr. Shakhashiri is a Professor of Chemistry at the University of Wisconsin-Madison and is the William T. Evjue Distinguished Chair for the Wisconsin Idea. 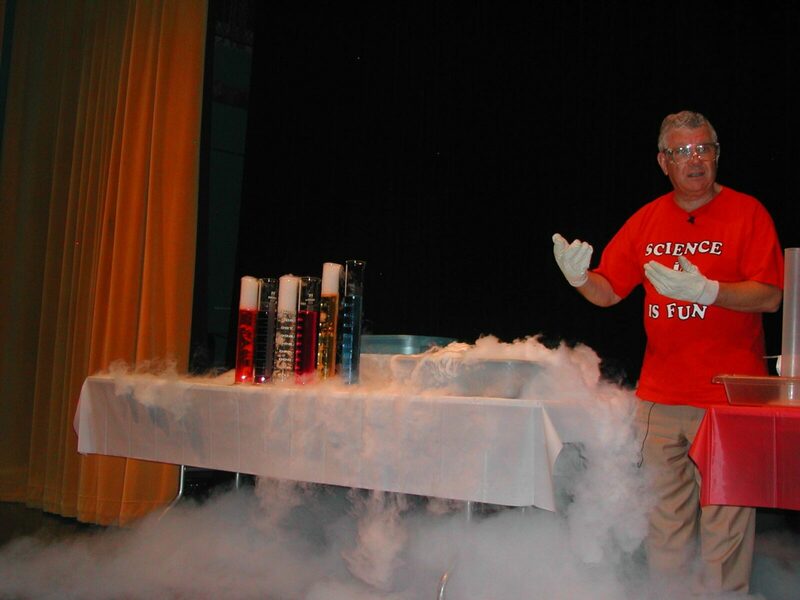 He has captivated audiences with his scientific demonstrations at a variety of locations including Boston’s Museum of Science, the National Academy of Sciences and the Smithsonian’s National Air and Space Museum in Washington. There will also be demonstrations and hands-on activities suitable for museum visitors of all ages. Children will be mixing chemicals to make propellants for their own mini rockets, making oxygen by water hydrolysis as is done on the International Space Station, comparing the elemental composition of Earth with other planets using brightly colored bead “elements,” and exploring “icy orbs” like the icy worlds being explored by NASA in the outer solar system.Cost: Free with Exhibit Halls admission. Explore the chemistry of exploring space and join the National Chemistry Week volunteers from 11am-4pm for hands-on activities suitable for all ages. STEM Family Fun Night is for students in grades K-5 and their families at the Brockton Library, 304 Main Street. There will be demonstrations and hands-on activities about bugs, ants and sea turtles. Experience a “Wetland in a Pan” and help create “Science Meets Art: Celebrating Diversity with Seed Mosaics.” Meet children’s science authors, experience Virtual Reality, learn computer programming with Ozobots and find out about the Library’s new “Brockton Kids Can Code” workshops starting in November. The Children’s Library staff will have lots of hands-on “Science Rocks” activities, and you can even take home what you make or discover! To attend, sign up in the Brockton Library Children’s Room: 508-580-7890 x301. Free event! STEM Career Showcase is for students in grades 6-12 and their parents at the Brockton Public Library, 304 Main Street. Meet college representatives and business professionals who will give you a wealth of information about STEM majors, internships and STEM career options for everyone. Have discussions with expert panelists representing a wide variety of exciting industries in healthcare, technology, computer programming and vocational programs. College professors and internship directors will also give you their thoughts on the future of STEM careers. Meet staff from partner organizations: CVS Health Care, Bridgewater State University, Atrius Health, Black Girls Code, UMass Boston, Forsyth Institute, Dennis K. Burke, Massasoit Community College, the Marjot Foundation, New England Carpenters Union and many more. Learn about new technology including 3D printing and Virtual Reality. For more information or to register: https://www.surveymonkey.com/r/stem-week. Free event! October 5: Free Friday night admission to The Discovery Museum in Acton. October 5: Ivy Seed Academy is hosting a computer science workshop for kids and parents in Boston. Free event + advance registration required. October 6- November 13 (Saturdays): Cascade is a free program for local 9th and 10th graders on five Saturdays from October 6 to November 3 on MIT’s campus. Take classes and hear guest presentations. Applications due on October 3. October 6-7: The Boston Mini Maker Faire at Boston Children’s Museum is an all-ages showcase of invention, creativity, and resourcefulness. Tickets cost $20-$30. October 27: Think Big is a chance for middle and high school students to network and talk one-on-one with professionals working in STEM careers at the Newton Free Library. October 27: WTS Boston will hold its second annual Transportation YOU Boston Summit for girls ages 12 – 18. This free event provides an opportunity to learn from local transportation professionals and college students by participating in hands-on workshops to introduce participants to a wide variety of transportation careers. Registration required. October 27: Attend Magic Math Fest and develop stronger math skills by playing math-related games like Magic Square, math magic tricks, logic games and more at the Brookline Public Library. (For grades 4-5) Space is limited and registration is required.